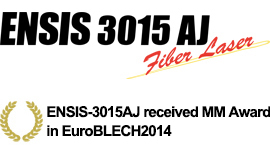 Energy saving, v-lot production, wide range fiber laser machine with process range expansion! 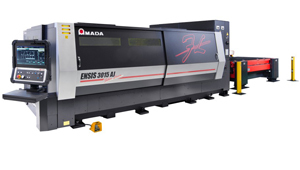 ENSIS-3015AJ is equipped with AMADA’s own developed fiber laser oscillator and the latest unique beam control technology for maximizing energy efficiency, while supporting higher efficiency in v-mix v-lot production. The laser beam configuration is controlled using AMADA’s unique beam control technology. The Process Range Expansion to thick mild steel. In addition, unlike conventional technologies, full range cutting capability without lens change. The characteristic of fiber laser have enabled the reduction of power consumption during processing and stand-by, as well as a significant decrease in CO2 emissions. The oscillator has been downsized by 50% from previous versions, and is built into the machine for space saving. The free selection of unloading direction of the material (right or left) according to the factory layout. The latest NC control AMNC 3i provides large screen with easy vision and operation with multi-touch method like smart phone, thus dramatically improving operability. Matching with various production requirement in Continuous automated operation.